For other uses, see Foxy Lady (disambiguation). "A Little Bit of Love"
Foxy Lady is the second studio album by American drag queen RuPaul. It was released on October 29, 1996 by Rhino Records. It is the follow-up to RuPaul's critically and commercially successful 1993 album Supermodel of the World. Foxy Lady explores similar genres to those of his first album, including dance and house. 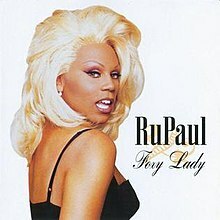 Rhino Records became RuPaul's new label with his second release, Foxy Lady. He co-wrote most of the songs, and as he explained to gossip columnist Smith in the Interview chat, "it's been scientifically engineered with my new radio ears for airplay, and it fits into a lot of different formats. One song, 'Falling', is about falling in love again which is tricky because people don't want to hear me sing about anything like that. They want [to hear] 'All right! You can do it!' Or 'You look good! C'mon out here!'" That track, "Falling", was an unusually mainstream R&B number, but Foxy Lady's first single was "Snapshot", the behind-the-wig tale of a drag queen. It would become the first Rhino pop song to chart since 1987. With a talk show, a music career, his 1995 autobiography, and steady film offers, RuPaul's plans to conquer the world with love and lipliner seem to be on the right trajectory. "We're all on this planet to learn and evolve and to be more godlike," RuPaul told Rolling Stone writer Anthony Bozza. "Each of us has such incredible energy, and once you understand it, the party really begins." Despite the huge success of Supermodel of the World, Foxy Lady failed to chart on the Billboard 200 despite reaching #15 on the Billboard Heatseakers chart and producing two mildly successful singles. Its first single "Snapshot" reached #95 on the Billboard Hot 100, #4 on the Billboard Dance Music/Club Play Singles, and #10 on the Billboard Hot Dance Music. The next single "A Little Bit of Love" reached #28 on the Billboard Dance Music/Club Play Singles. The single's music video depicted RuPaul along with female impersonator Jazzmun and transgender cabaret performer Candis Cayne as aliens out to conquer the world. The video received a GLAAD Media Award nomination for Best Video of 1998. The clip, directed by Randy Barbato and Fenton Bailey, was in included on RuPaul's Work It Girl compilation DVD. Foxy Lady received generally positive reviews upon release in November 1996. Billboard said it "offers a glimpse into a soulful stylist who needs to be heard far more frequently in the future". Stephen Thomas Erlewine from AllMusic said "Foxy Lady was an attempt to expand RuPaul's pop culture phenomenon status into a genuine career, and it didn't quite succeed. Although RuPaul is supported by a number of fine producers who help give the album a sleek, attractive sound, the record lacks a song as catchy or kitschy as 'Supermodel,' which ironically makes it a bit of a faceless album." Alanna Nash critiqued the album for Stereo Review and faulted a disco-beat-heavy production, which she theorized was perhaps the result of its several producers. "Foxy Lady often sounds like the rumblings of a bank of overheated computers," Nash opined. 3. "A Little Bit of Love"
11. "Snatched for the Gods"
This page was last edited on 3 November 2018, at 17:17 (UTC).